There was a time, before Tommaso came into my life, when I would share my bed with a stack of cookbooks. I knew them by name, I would leaf through them before falling asleep, I would take note of all the recipes I wanted to try. I found words and meanings that went far beyond the ingredient list. Those cookery books made me dream, they intrigued me and amused me, sometimes they moved me to tears. I brushed pages of photos with the same affection with which I would caress the cheek of a child. I would turn in my mouth phrases, adjectives and procedures as you would do with the verses of a poem. Cookbooks gave me wings when I felt my feet heavy, sunk into the ground. I always thought that a cookery writer puts together a story that will then develop through our five senses. You would never put down a good novel, you would not close such a book. If you are reading a good cookbook, though, all of a sudden you would jump from your chair, close the book and run into your kitchen to list the ingredients you need to bake that cake you just read about. 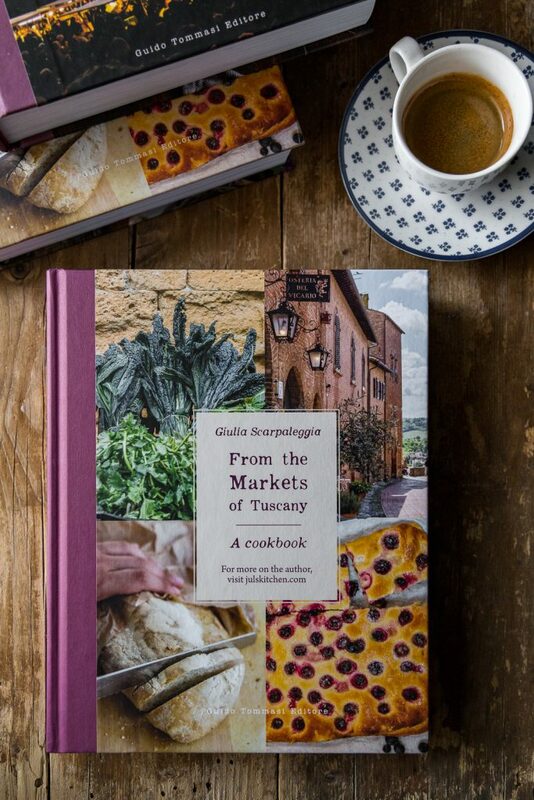 Today we celebrate eight years of Juls’ Kitchen and my fifth cookbook, La Cucina dei Mercati in Toscana, published by Guido Tommasi, which will be out in Italy on February the 9th. So exciting. We celebrate two long and exciting years of work that forced me to grow and to develop my passion and curiosity. If I browse through all the photos taken around Tuscany with Tommaso I can still feel the heat of that 2015 torrid summer, that sudden downpour which completely ruined a photoshoot. I can see groups of Tuscan nonne in line at the market to buy basketfuls of oranges or bunches of artichokes. The words of the vendors resound in my mind: they do not sell just an ingredient but a collection of stories, recipes and traditional uses. I see us in the car planning future trips around Tuscany to photograph a market and a life together. I look at the one hundred and five recipes that make up the book, and which tell so much of who I am, what I like, how I cook and eat. All my gratitude then goes to those people who, for passion and friendship, helped me discover the markets of Tuscany, pointing out to producers, stalls not to be missed, local products and unique stories: Gigliola and Francesca for Florence, Kirstie for Greve in Chianti, Luisa e Martina for Val d’Orcia, Laura for Siena, Andrea for Valdarno, Annalisa, Ilaria, Giovanna and Simona from Farfalle in Cammino for Lunigiana, Annarita, Alessandro and Cinzia from Renaissance Tuscany Il Ciocco Resort & Spa for Garfagnana, Molly and Emanuela for Pistoia, Maria for Montecatini, Aurelia for Prato, Serena for Versilia, Kinzica for Pisa, Marco for Volterra, Enrica and Paolo for Livorno, Emiko for San Miniato and Argentario. More than 60 recipe testers! When someone chooses your book among the hundreds of cookery books available in a bookstore, you have an enormous responsibility. Huge. He trusted you and you are not supposed to let him down. Not only the book has to be written with heart and honesty, but the recipes have to work. This is, for me, the minimum and essential criterion for a cookbook to be a good book. After having written and tested the recipes in my kitchen, I sent an SOS to find volunteers who’d want to become recipe testers. You made this book better. Thanks to Alessia A, Alessia M, Anna, Anna Giulia, Benedetta, Chiara M, Chiara T, Cristina, Deborah, Elena F, Elena O, Elena S, Emanuela, Enrica, Erika, Fabiana, Franco, Gaia, Gianluca, Heather, Irene, Lara, Laura, Lidia, Lorella, Lorenza, Mariagrazia, Marica, Marilù, Martina, Melissa, Michelle, Monica, Ottavia, Patrizia, Piyanut, Rosemarie, Rossella, Sara, Simonetta, Stefania, Tamara, Valentina D, Valentina P, Veruschka, Virginia and Yu Qiong who enthusiastically welcomed my call for help, giving me a big help to test all the recipes in the book so that they could work well in any kitchen. 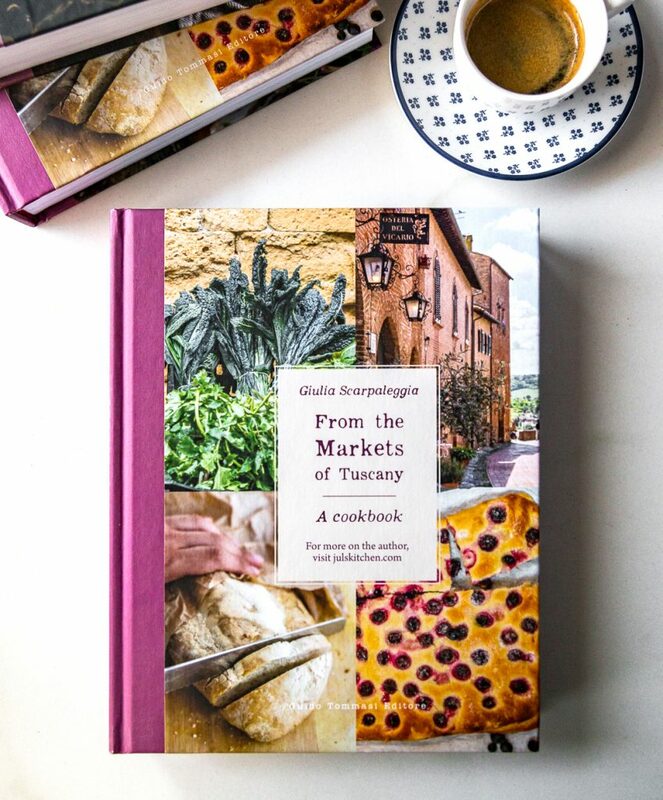 The English version, From the Markets of Tuscany: A cookbook, is available from the 19th of April in Italy and from the 1st of June in Europa, US and Canada. A huge and heartfelt thank you to Amy Gulick who did a priceless and excellent job in translating the book in English! Preorder on Amazon.it, Amazon.com, Amazon.co.uk, Amazon.ca or buy it from the 1st of June on your local bookstore. The faces of the people at the market: farmers, producers, butchers, fishmongers and fishermen, vendors, bakers and confectioners, generous and enthusiastic. They are the true rock stars! Great idea and from what you have shared with us about the book, I see that the creative and successful realization makes this idea even greater. I look forward to the English version. I was reading this post with my late breakfast next to me, a small cast iron pan which I was almost hugging to keep warm. It was filled with leftover roasted peppers which were so soft they nearly became sauce, a few leaves of kale, saved from being discarded just in time as even a few leaves of cavolo nero can give a flavour kick to any meal. This was all bound together by the white of a large hens egg and in another pan, I fried the leftover polenta crisp and brown until they’d become something more of a treat, like eating chips for breakfast. And all that I was transporting from pan to mouth will hanging on your every word here on your blog. THIS book I would so love to read, I can not tell you how much I’m hoping for an English translation, especially since I’m used to speaking and reading your English. I think you have outdone yourself, this is truly an evocative work. The passion from the market traders and your will to note down their story and their recipes shines through. I would not be surprised it this book one an award? As far as Italian cookbooks go, this is truly unique, a completely refreshing and new way of looking at Italian food culture. I’ll be telling every English publisher I know about this, have no doubt. Pure out of the selfish need to read this book, have it with me in bed for my few paragraphs every night before I fall asleep, and in the kitchen to guide me with your clear instruction. Congratulations dear Giulia. What a beautiful layout. Can’t wait to read the Italian prose. Bravissimo! In Inglese per favore! I hope it’s available on line here in Canada. Though my Italian is mostly the Venetian dialect that we spoke at home, I would love this book for its beautiful pictures, your recipes and prose. I look forward to looking for it. Another fantastic book Giulia! I cannot wait to read it. The Tuscan market is truly a thing of wonder worth celebrating as much as the produce you can purchase there. Please do an English translation – I can think of many people who would LOVE this for their Christmas present this year! Congratulations, Giulia! We are so pleased with all that you continue to accomplish; the book promises to be very special. The English translation should be a huge success, also. Now you must plan to visit with us when you do your US book tour! Keep up the great work!! We hope to see you again sometime in the future! Bravissima, Giulia—congratulations! I look forward to seeing you at your book launching here in Florence on 21 Febbraio to get my signed copy. It looks like a beautiful book, filled with your love for the food of Tuscany. Like others who have responded, I also look forward to the English version. My mother is from Sondrio but I haven’t had a chance to actually visit her home region. I’ve always dreamed of visiting one day with my family, and perhaps scour the farmer’s markets there for gourmet ingredients. How I wish! For now, I’ll just settle for a box of gourmet ingredients I recently ordered online. Reading your post, I can hardly wait for it now. Hi Giulia, I’m really looking forward to English edition of your new cookbook! Hope it’s soon because I can hardly wait! Love what I’ve seen so far! I live ‘next door’ in Greece and lots of the landscapes and ingredients are very similar to Tuscan ones! All the best for your new book! Congratulations on a beautiful work of art….The passion shines through. I wish my Italian was fine enough to read the recipes….I will ,however, hopefully wait for the English translation!. I have 400 cookbooks and stopped buying them….but this one I would make an exception for!! Can’t wait for the English language version! Love the pictures. Are your other books available in English? Hopefully we’ll have an English version within the end of the year! As for the other books, at the moment only I Love Toscana is available in English! previous post: My favourite Tuscan cookbooks, Florentine and a giveaway!